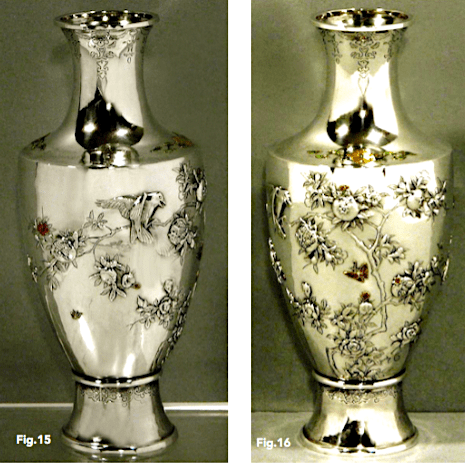 All world silver categories have their own peculiar, often unexplainable, anomalies; Qing Dynasty Silver [aka Chinese Export Silver] is not an exception. In the latter half of the 20th century, Chinese Export Silver was finally resurrected from the backwaters and a degree of investigation occurred, mainly in Massachusetts, having been a mostly unknown silver genus, certainly in the Western world, since the heady days of the China Trade . Even when it was lifted out of the darkness, this Chinese silver category remained very much unheard of until some six or seven years ago; yet it is still much mis-understood. Based on the information available during the 1960s-80s, the results of the research that was carried out certainly created a new benchmark knowledge base, but John Devereux Kernan, in the 1975 book he co-wrote on Chinese Export Silver , wrote that he was aware future scholars would carry out further research and a new knowledge and understanding would evolve. With the amount of information that has since been uncovered and recorded, it is now possible to have a much truer understanding of this silver category; it still remains, nevertheless, a complicated silver category for a whole variety of reasons that other silver categories don’t have. In order have a more finely honed understanding, it is essential to understand the complex local circumstances during which it was created. There was an entirely new dynasty in China, Manchu as opposed to Han. It was a dynasty where great administrative changes would occur in China; it was a dynasty where decorative styles would dramatically change across the board. It was also a dynasty where new challenges would be presented to China, the most relevant being the pressure from Western trading nations to access Chinese goods and markets that in turn created the phenomenon we know as the China Trade. It was this particular dynamic that created the small area of Canton where, by Imperial decree, certain foreign merchant groups were allowed to be resident in China for part of each year and the import and export goods was allowed within a strict customs system. This then led to an eventual array of treaty ports being allowed to develop along the eastern and southern coasts of China and at one point at the border between China and Russia. Much of this is relatively well-known, but the fact that much the same was happening in Japan around the time treaty ports were developing in China is not exactly common knowledge. In 1859, Yokohama was designated a Japanese treaty port as a result of the 1854 Convention of Kanagawa being signed between The United States and Japan. When Commodore Matthew C. Perry of the United States navy first landed on Japanese territory at Shimoda in 1854, it was still the Ryukyu Kingdom; in 1879 it was abolished and annexed by Japan as the Okinawa Prefecture . Americans committing offences against Japanese would be tried in American consular courts and, should they be found guilty, punishment would be according to U.S. law. The treaty’s provisions gave Americans residing in Japan a great advantage. Great Britain, France, the Netherlands and other European nations, soon signed similar treaties with the Shogunate government, which was already weakening. It should be stressed that between 1641 and 1854, China Korea, the Ryukyu Islands [modern day Okinawa] and the Netherlands were the only foreign territories that had any regular interaction with Japan. While other treat ports, such as Kobe and Osaka, existed, it was Yokohama that benefitted from more freedom than was generally allowed to foreigners. Yokohama had many similarities to Canton; the area designated as the treaty area was an island, the Japanese and foreign communities were segregated and a strict purpose-built customs system was in force. Yokohama was an afterthought; Harold S. Williams wrote  “Whilst the foreign ministers were drawing up plans for the future foreign settlement in Kanagawa, the Japanese authorities had decided that it would be better that the foreigners should be relegated to the little fishing village of Yokohama [which was] then far removed from the Tokaido — the great artery of Japan — and was of no importance and without resources”. While this was true at the time, Yokohama was quick to develop into something quite other. The entrepreneurial energy that was to evolve was similar to that of post-1842 Hong Kong and Shanghai. A significant factor in this new dynamism was the outbreak of the American Civil War in 1861 that was to last four years. From an American standpoint, a rapidly expanding nation westwards to include the accession of California and Texas to the Union and the growth of the whaling industry caused America to look further West to East Asia . Given the prohibition of foreigners from practicing business outside the concessionary areas, they traded with Japanese merchants specialising in the trade of exports and imports within the concessions of treaty ports. Western trading companies, Japanese exporters and Japanese importers gathered in a very small enclosed space inside the concession of Yokohama, where all trade transactions were settled. As with the Chinese treaty ports and the rapid rising dynamic of British Hong Kong, the dial of entrepreneurial energy created in Yokohama soon set at maximum . One of the most significant ways Yokohama, as a treaty area, differed from Canton, Hong Kong or Shanghai is there was a relatively substantial Chinese presence. As the port was to develop and circumstances were to change in China, namely the fall of the Qing Dynasty, affluent Chinese used Yokohama as a fun resort as well as a safe haven during the turmoils of the early republic era in China. Most significant of all was the accession of the Emperor Meiji to the Imperial throne in 1867, which was swiftly followed by the instigation of the Meiji Ishin or the Meiji Restoration as it was known in the West. Not only did this drastically reform and consolidate political and social systems including the final abolishing of the Shogunate and the Samurai class, it was to have an enormous influence on the decorative arts as a whole. 1868 heralded the formalisation of religions in Japan. Shinto became the official state religion and a great number of shrines became state funded. The god Ameratsu, formerly a minor divinity, was made the central divine focus and the Emperor was created the high priest of Shinto  Shinto was therefore completely separated from Buddhism; Buddhist imagery was eradicated from all shrines. An entire reorganisation, if you will, of the pantheon of Japanese spirit beings had to happen. Shinto became the primordial glue that bound the Japanese people together. Shinto was regarded as inseparable from the ‘Imperial Way’ and inseparable from the fundamental ethical and social code of Japan. Shinto was elevated to a level whereby it was so superior to other religions that it was regarded as being non- religious. In the context of the world of Japanese silver making, this came as a huge challenge. Buddhist imagery, in fact imagery that did not form part of the Meiji Reformation, was officially discouraged. At the same time, the daimyō of Satsuma  appointed Western experts to help Japan learn as much as possible from the West. Japan urgently wanted to become westernised; the exact opposite, it could be said, to China. A British diplomat of the time wrote: “The Japanese, if not actually in a state of progressive advancement, are in a condition to profit by the flood of light that is about to be poured on them”. Again, unlike China, Japan took the participation in the many expositions that were held in the Western world in the latter half of the 19th century extremely seriously. 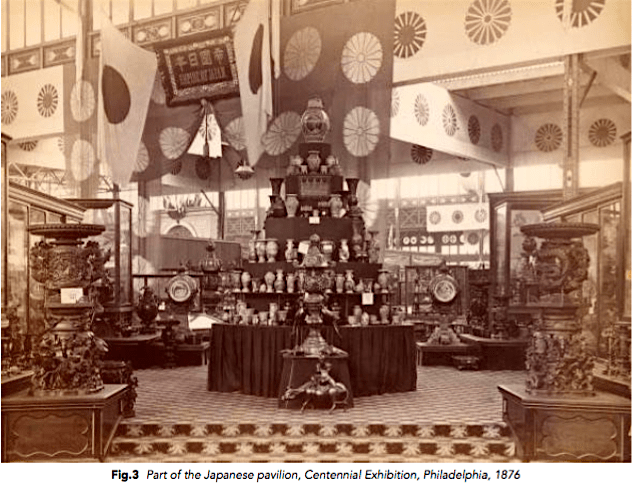 At the Centennial Exhibition held in Philadelphia in 1876, Japan committed to spend $600,000 [over $12million today] at the event, the largest sum of any of the thirty nations participating. Japan was to exhibit 30,000 items; the pressure for artisan- led trades, such as silversmiths, was to produce export items suitable for the West but that looked definitively Japanese [to Westerners]. 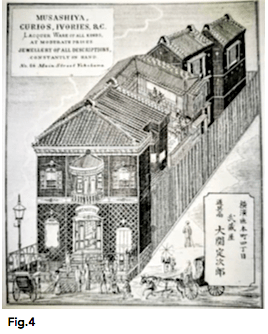 After it opened, the focus of almost all editorial reporting was the Japan pavilion; Japan-a-mania had hit America – 10 million people visited the Japanese pavilion. It was the Centennial Exhibition that was the catalyst for the new American and the already burgeoning European Japanophiles to embrace the craze for Japonisme. Not only was there a fever-pitch need to own and use all things Japanese, Japonisme was to influence many Western artists and artisans across the entire art spectrum. Japonisme was, in many ways, one of the main instigative factors of the Western modern art movements. Fourteen of the commissioning companies and individuals recorded in an 1879 Yokohama trade almanac were specifically registered as being involved in export. Yokohama grew to have a foreign population of 3,000 by 1880; 600 British, 200 American, 100 other Europeans, and more than 2,000 Chinese. The best known of these exporters was Ozeki Yahei, who not only had his signature on a great number of Meiji artefacts, he had set up an operation in Yokohama, soon after the 1859 opening. The Yokohama branch, as he referred to it, was managed by his son Ozeki Sadajiro and it was he who opened a retail store at 66, Main Street, calling it Musashiya. Ozeki Sadajiro set about commissioning some of Japan’s foremost artisan silversmiths to create items specifically for Musashiya and designed for the Western Japonisme taste; these items were calculated to be perceived as small works of art. 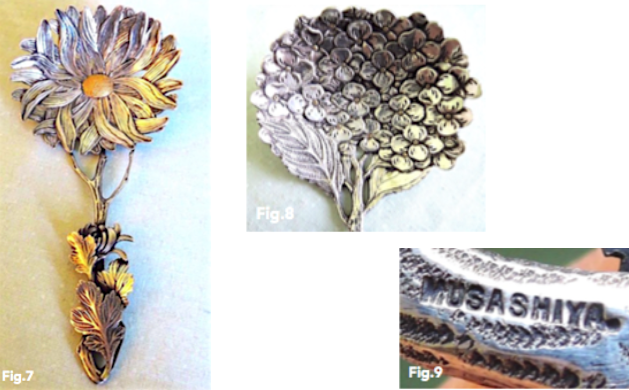 Silver items created for or by Musashiya Yokohama generally carried a version of the mark shown in Fig.5. Sometimes an additional artisan mark was added. The vast majority of the silver wares on offer were specifically aimed at the export market and the styles of these wares mirrored this. 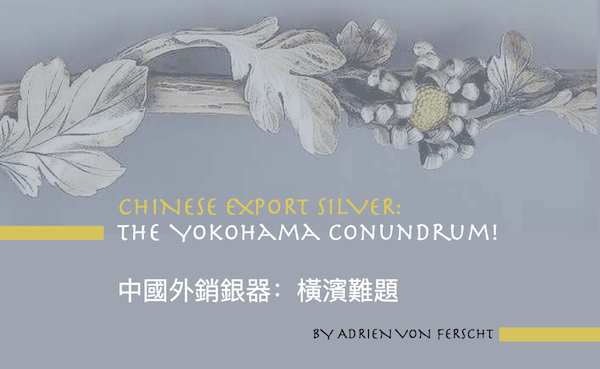 Yokohama silver makers and retail silversmiths, together with all the other Japanese decorative arts such as shibuyama, lacquer and carved ivory together created a dynamic force to create what were in effect Meiji hybrids. The demand was huge and this, in turn, attracted established purveyors of luxury goods and dealers in Japanese Art to set up branches of their businesses in Yokohama; businesses such as Arthur Bond & Company [a London-based company with another branch in Kobe as well as Shanghai], Samurai Shokai [the business of Yozo Nomura that literally translates as “the trading company of the knight warrior”], Kuhn & Komor [One of the the commissioning agency companies that formed the nucleus to what came to be known as the “curio” trade – curio being an abbreviation in the 19th century for items related to the Far East, who also had branches in Hong Kong, Shanghai and Singapore]. The combination of the intensity of the Yokohama dynamic and the ferocity of the craze for japonisme brought specialist dealers and retailers to Yokohama. In the context of Great Britain, Arthur Lasenby Liberty, the founder of the Liberty store in London in 1875, visited Yokohama in 1889 and among other decorative arts companies, he formed a working relationship with Ozeki Sadajiro, This, in turn, incentivised the latter to create items that specifically fitted into the Aesthetic Movement that was riding high 1870-1900 and Liberty of London was one of the homes of the movement . Designers such as Christopher Dresser, the great advocate of the Japanese style, travelled to Japan as a representative of the Victoria & Albert Museum in order to acquire items for the museum’s collection. Dresser then went on to infuse Japanese influences into items of silver and electro-plate aesthetic style silver he designed for various manufacturers such as Hukin and Heath. The Musashiya company, created by Ozeki Yahei and under the aegis of his son Sadajiro, became perhaps the most successful of the concerns selling high-quality decorative art during the Meiji era. Sadajiro’s openness to collaborate with enterprises such as Liberty of London enthused him to work with some of the finest Japanese artists and artisans. Many of these items happened to be spoons, but spoons that were each a work of art. Some he marked Musashiya, while others he decided to mark with the initials “S.M.”, the latter created out of Sadajiro and Musashiya. Many of these spoons were actually creations of some of Japan’s most-notable artisans exclusively at the Musashiya workshops. The exquisitely made lidded lotus form condiment pot [Fig.12,13 & 14] is, perhaps, a perfect example of the degree of artistry such a small item demanded in the eyes of a master Japanese silversmith and Sadajiro. It carries the S.M. silver mark [Fig.14]. At first glance, an illustration of a vase [Fig.15, 16 17 & 18] created at Musashiya and carrying the S.M. mark, it is easy to automatically think that this is a tall vase, given the amount of decoration that has been applied to it, some of it enamelwork. It also carries a chased inscription on the body of the vase that reads Shou Chang Bei “The Vase of Longevity” [Fig.17]. The reality is the vase is just 20cm tall. 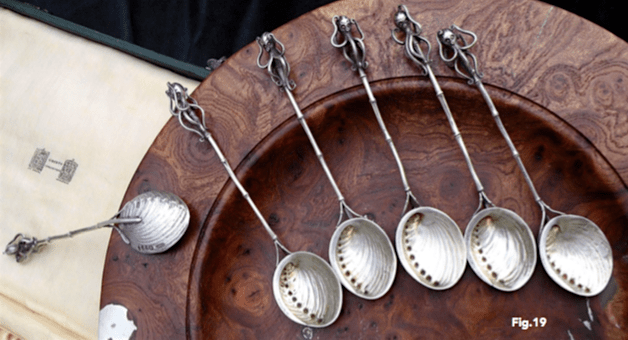 The set of 6 spoons with abalone shell-form bowls, amusing, slightly distraught looking but beautifully crafted octopus finials on faux bamboo stems [Fig.19, 20 & 21] carry both the S.M. mark and the Liberty & Company hallmark for London with the date mark for 1893. This was almost the middle of the “arts and crafts” movement in England and one which had Liberty & Company very much championing it. Arthur Lasenby Liberty was consciously evolving what was to become a definitive Liberty style and the arts and crafts and aesthetic movements lay deep in its foundation. The aesthetic movement was often perceived as being closely linked to hedonism, the movement for all joy junkies that prioritised joy before everything else; this was the age of Oscar Wilde and “The Picture of Dorian Gray”. This appears to have fitted the Liberty profile well. The S.M. 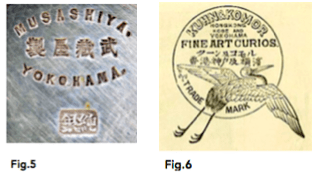 silver mark has been an ongoing conundrum of both Chinese Export Silver and Japanese Meiji silver. Of all the marks from these combined silver categories, this has been the mark that has probably been the most misunderstood; I can count myself among the confused. Having researched it in-depth and with a degree of hindsight, silver carrying the S.M. mark could never possibly be Chinese, even though a significant proportion of the artisan silversmiths in Yokohama were Chinese. S.M. marked silver is undeniably Japanese. Over the years, Japanese silversmiths had developed new decorative techniques working in silver that did not exist or appear on Chinese silver of any era; techniques such as the integration of shakudō  elements into silver pieces, shibuichi , kuromido , sentoku , mokumegane  and the use of kinji  lacquer. That said, silver carrying the S.M. mark did appear among Chinese retail silversmith’s inventories. Special thanks to Dr Chao Huang, Sun Yat-Sen University, Guangzhou, for his ever-present help when required. 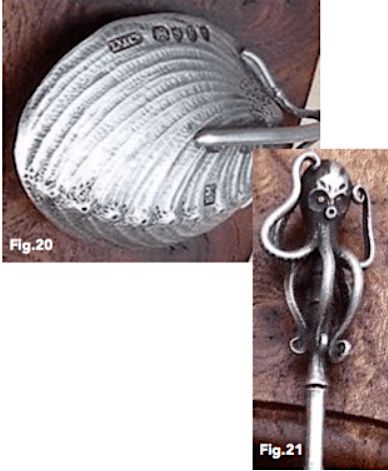 Fig.19, 20 & 21: “Artists’ Spoons & related table cutlery. A British history of Arts & Crafts flatware”. Fastprint Publishing, Peterborough, UK. Simon Moore, 2017. Narrative of the Expedition of an American Squadron to the China Seas and Japan, Francis L Hawks, Mineola, NY: Dover Publications, 2000. Shakudō – typically 4-10% gold, 96-90% copper. One of the irogane category of coloured metals – usually treated to attain a black or indigo patina or can appear bronze in colour if boiled in a solution. Shibuichi – a Japanese copper alloy used for centuries, also one of the irogane category of metals. It can achieve patinations of blue, green or brown using the niiro-eki process which uses a copper sulphate, copper acetate, calcium carbonate and sodium hydroxide – a formula known as rokushō. With the addition of alum or borax achieves different colour patinations. Kuromido – a Japanese alloy of 99% copper and 1% metallic arsenic [Also one of the irogane category of metals]. Mokumegane – a Japanese metalwork process whereby a woodgrain texture can be achieved.